Documentary looking at how the island community of Orkney, located off the north east coast of Scotland, copes with the onslaught of tourists from cruise ships. As part of BBC One's Our Lives, this film captures the stories of Orcadians whose lives are impacted by the onslaught of tourists. There will be 140 port calls this year, with more than 120,000 passengers. That is six times Orkney's entire population. For many, this is something to be celebrated. More people means more money coming into the islands. It is estimated that the industry brings in between seven and nine million pounds to the local economy - much needed revenue to help sustain a small and remote population. For others, it's a pain. Kirkwall can sometimes be so busy that it's hard to make your way through the main street. Many residents steer clear on cruise ship days, and some cafes and restaurants complain that they actually lose money, as passengers nurse teas and coffees for hours or head back to the liner for their all-inclusive lunches. There's also a growing concern about the environmental impact and for Orkney's world-famous Neolithic sites, including Skara Brae, Stenness and the Ring of Brodgar. How long can these fragile World Heritage sites maintain coachloads of people wandering around? No matter which view people may take, the spirit of the community has stayed strong as they try to provide a genuine Orcadian experience for their guests. Cruise ship days unfold like a perfectly choreographed show, and many Orcadians play their part. From the meet-and-greeters at the pier, the free shuttle bus service into town, the tour guides, local businesses and the pipe band who play the liners out at the end of the day. This character-driven documentary uncovers what it's like to be a part of this 'show'. First Vikings, now cruise ships! 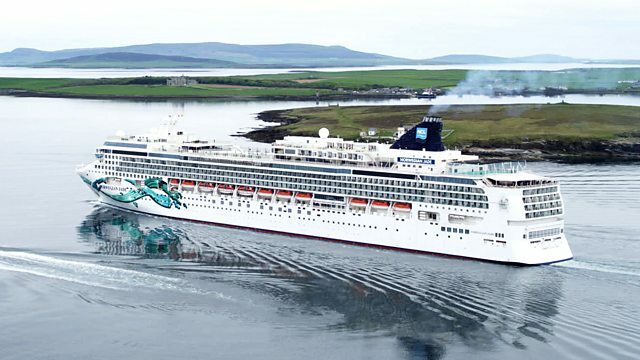 Kirkwall welcomes the Caribbean Princess cruise ship but, unfortunately, she’s not brought Caribbean weather!